Working with Guy’s & St Thomas’ Charity, Festoon designed the data visualisation report: 'From one to many’. 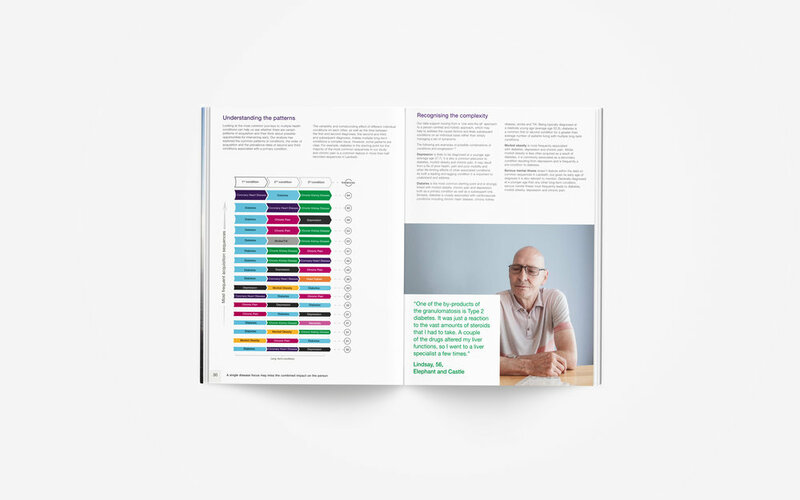 The report explores and visualises data on multiple long-term conditions in Lambeth and Southwark and was based on research carried out by Kings College London. The visualisations were produced with a combination of QGIS(mapping), Microsoft Excel and Adobe Illustrator. To find out more about the project on the Guy's & St Thomas' Charity website where you can also download the full report. We all have to make big decisions in our work lives. What drives yours? We developed a series of infographics exploring and comparing the influences, implications and reasoning behind the decisions we make in our daily work lives. To gather the information we developed an online survey to collect information on decisions from a number of professionals. Visualisation 1: What's toughest decision you've ever made? Survey participants were asked what the hardest decision they ever made was, whether it be within their workplace or about their career. This graphic tries to understand and categorise their responses. A simple comparison of the daily decisions that we make in our professional lives on a large scale. We focussed in on the routine decisions of a doctor. An interactive data visualisation displaying the variety of expeditions taken by scientists to the Chagos Islands throughout the years. The interface allows users to filter time, and expedition type to emphasise the variety of expeditions taken. An interactive version of the design can be found in the middle of the page at https://chagosinformationportal.org. Visualisation from pHd study: The young people and digital media project.